Our episode opens with Buffy and Jody waiting in the lobby for the mailman. They are expecting a letter from Uncle Bill, who is on Rome in business. When the letter arrives, however, it seems that Bill has more than business on his mind. 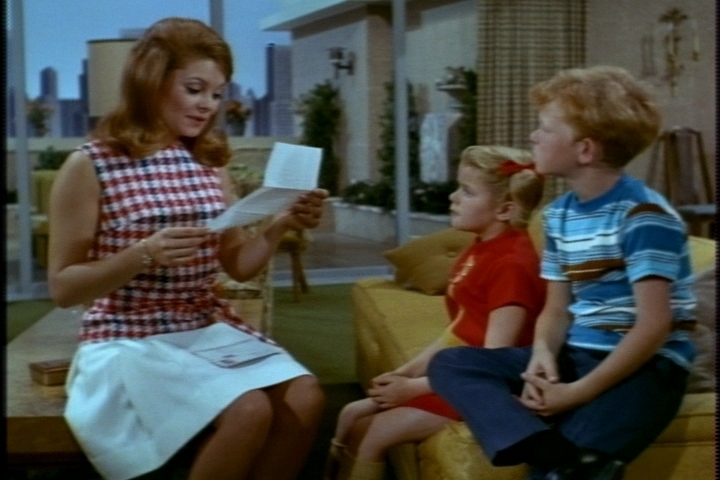 Cissy reads to them about Lucianna, whose father is Bill’s prospective client. Lucianna, who lives in a villa, has been showing Bill the Roman sights. 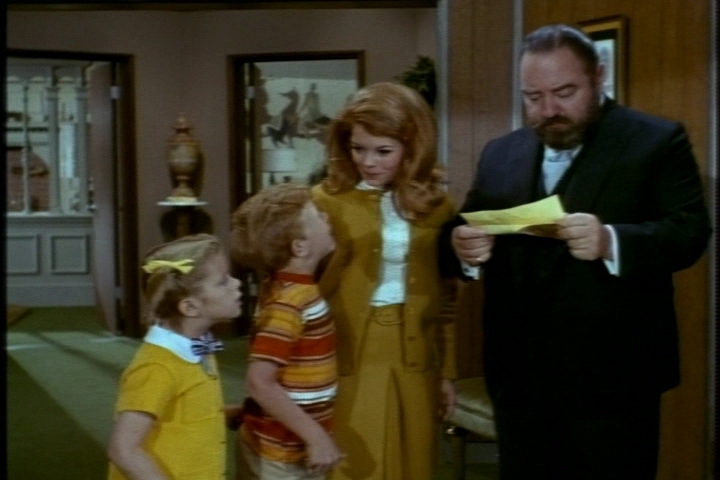 Cissy explains to the kids that a villa is “better than a house but not as good as a palace.” She also has to explain that Bill’s closing, “Ciao,” means goodbye. The twins are more worried about what Bill didn’t say–anything about when he would be returning. Soon we get to see what’s keeping Bill in Rome. Lucianna is one of Bill’s prettier love interests, but that pile of hair on her head looks as unstable as the leaning tower of Pisa. She and Bill engage in some flirty back-and-forth about whether he really has to leave Italy so soon. It’s enough to disgust the beleaguered waiter, and I don’t enjoy it much, either. Back at home, the twins overhear French making inquiries about a valet job in another household. In typical Davis fashion, they assume the worst instead of sticking around to ask questions. 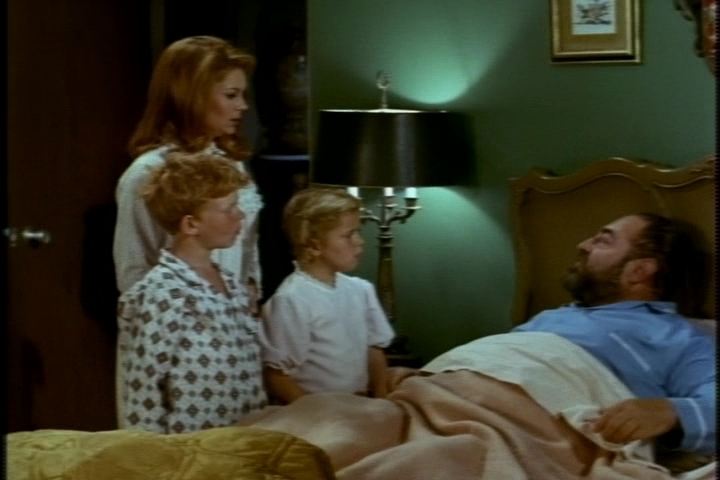 This is the episode’s first Retreat of Sadness. 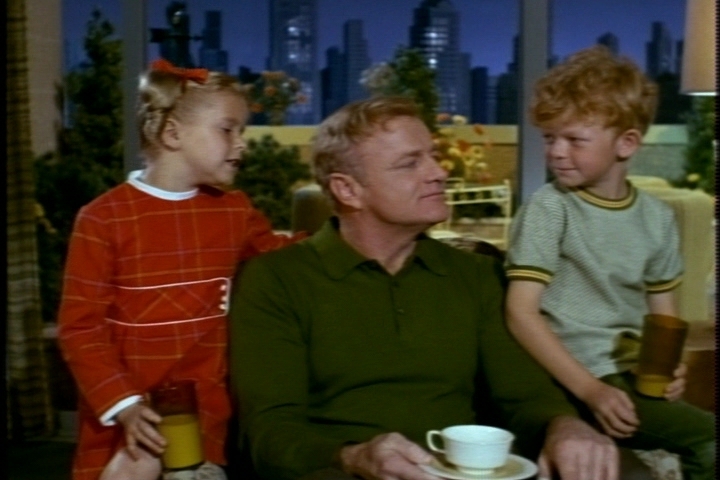 They try to tell Cissy their concerns that Bill will decide to marry and stay in Rome. Cissy’s head is full of her new boyfriend, Ken, and she can only blather on about how romantic a double wedding in Rome would be. Jody raises that possibility that Ken won’t propose, especially if he ever sees Cissy in curlers. 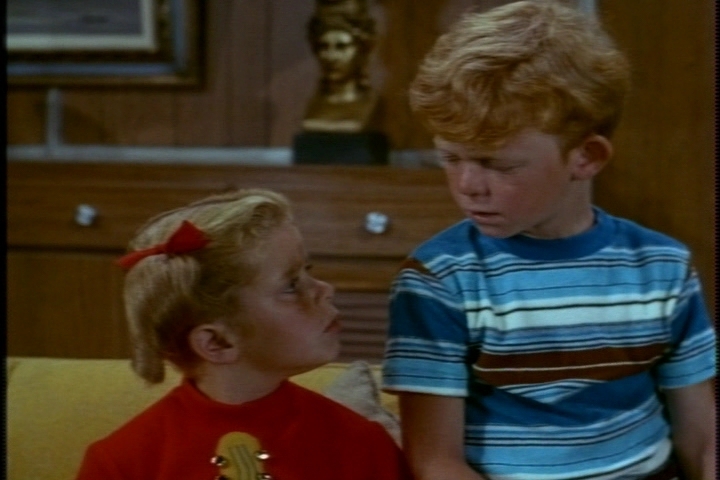 He also points out that Cissy is very young. 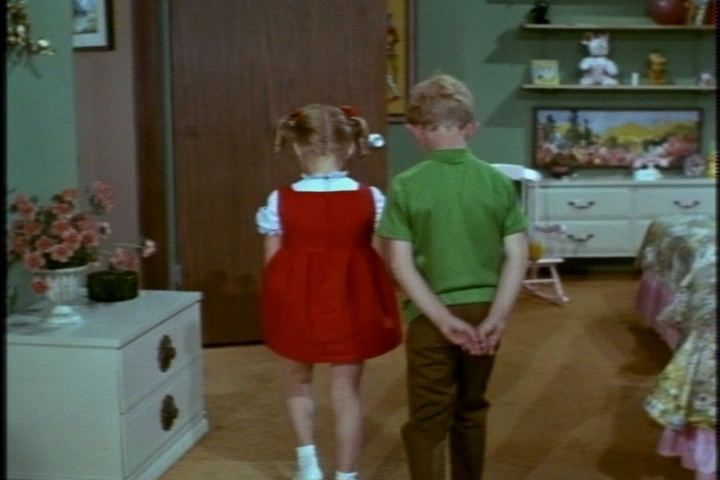 “Gather ye rosebuds while ye may,” Cissy responds. Retreat of Sadness number two. Back in Rome, Bill and Lucianna are getting closer. He worries about their age difference and their short acquaintance, but she assures him that she knows what she wants. 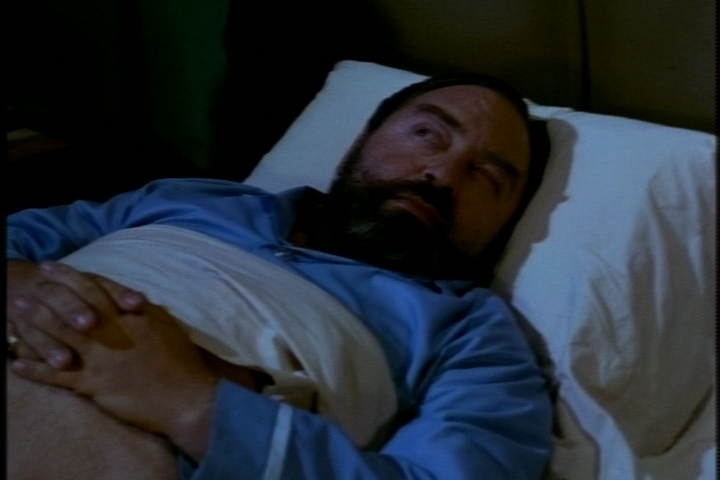 That night, both Buffy and Jody are kept awake by fear–fear that Bill will stay in Rome and leave them behind. While Cissy is marrying and picking rosebuds, they will be split up again and parceled out to other relatives–this time for good. Jody promises to take care of Buffy, a theme that always tugs at my heartstrings. Buffy is more realistic, saying that the adults won’t let him. 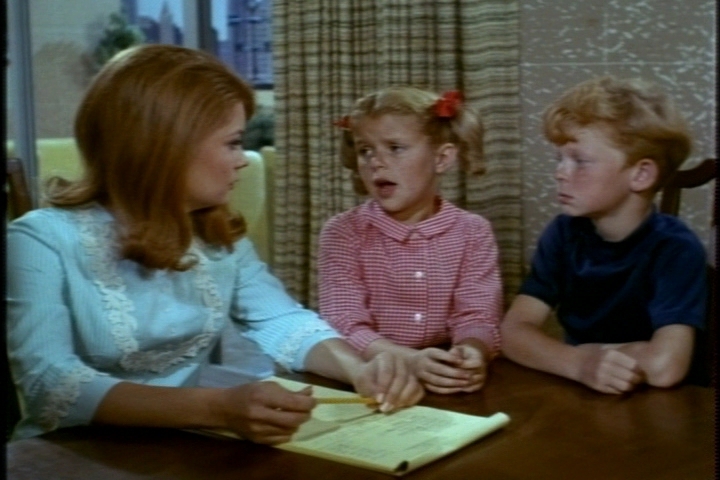 Luckily, Cissy comes along and sees how upset the kids are. She assures them that Bill will be coming back in a few days. “If you don’t believe me, ask Mr. French,” she adds. Of course, the kids run off to ask him right away. He’s delighted to see them. French, too, tries to reassure the kids. The job he was inquiring about was for a friend, he tells them. When the twins bring up Cissy’s impending marriage, she asks where they ever got such an idea. The next morning, everyone is excited when a cable from Bill arrives. They expect him to announce when he’s coming home, but instead their fears are realized: Bill is getting married and planning to live in Rome. Retreat of Sadness number three. 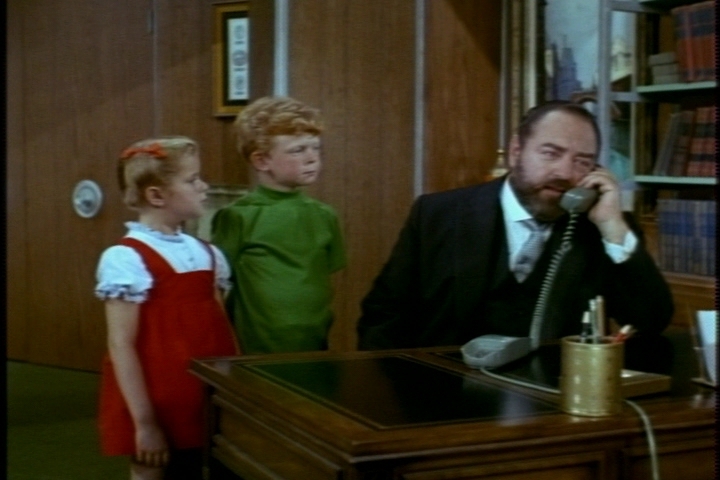 That afternoon, before the twins get home from school, Bill reaches Cissy by phone. Heading off to a party with Lucianna’s friends, he’s a bit short with her. He urges French to start learning Italian so he can manage Lucianna’s household staff. He doesn’t say anything about the kids coming to Italy, however. 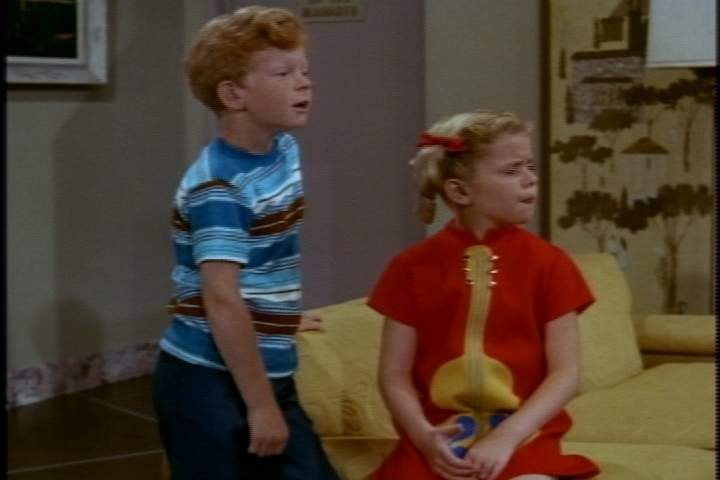 French and the twins return to find a despondent Cissy, who is convinced Bill is really abandoning them. French does his best to convince the kids that Bill meant for all of them to go. He even offers to–gasp!–call Bill and ask him a direct question about the situation. Cissy, however, advises against it. Eventually, the kids get French to consider the possibility that Bill’s new wife won’t want them around. French say, in that case, he won’t be going either. “You mean right away?” Buffy asks. “I mean at all,” he says, firmly. 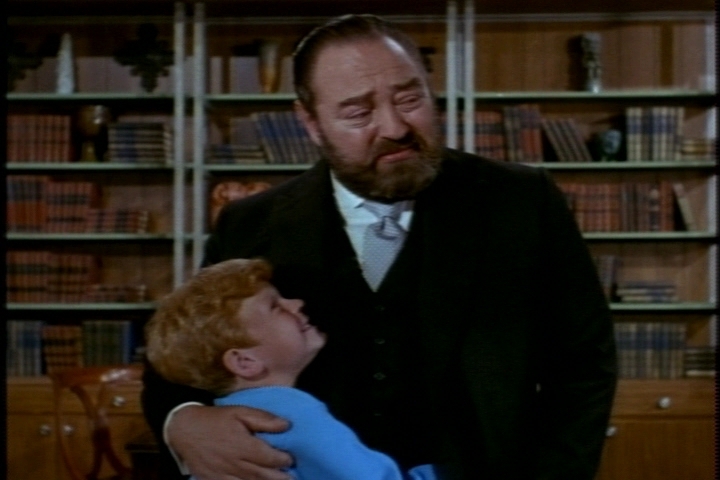 “I won’t see you divided among relatives like so many pieces of Yorkshire pudding!” he cries. Meanwhile, in Rome, Lucianna is pressing Bill to set a date and start planning the wedding. She’s delighted that he plans to bring the kids over for the ceremony. It will be lovely to get to know them, she says, even if it will only be for a short time. Bill says he thought it went without saying that the kids would live with them. Soon, it’s clear that neither one of them will budge on this issue. Back at home, French is making practical plans for supporting the children. The rent is paid on their apartment until the end of the year, he notes. He decides to investigate the valet job opening for himself. His inability to live in with his potential employer is a deal-breaker, however. 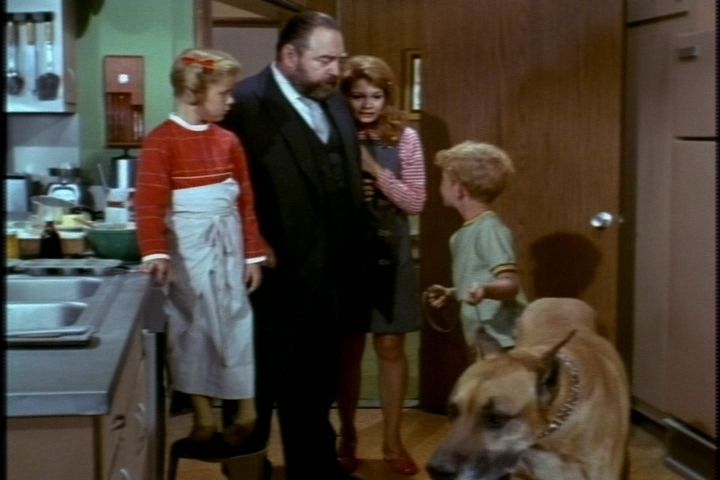 While French looks for work, Cissy and the kids take over some of his domestic duties. French won’t let Cissy quit school to take a job selling hosiery, but Jody does take on a new responsibility. He takes up dog-sitting, while Buffy tries to help French economize by making her own cupcakes. A knock at the door soon changes everything. That night, the twins express how worried they were about the family splitting up. Bill reassures them that it will never happen. 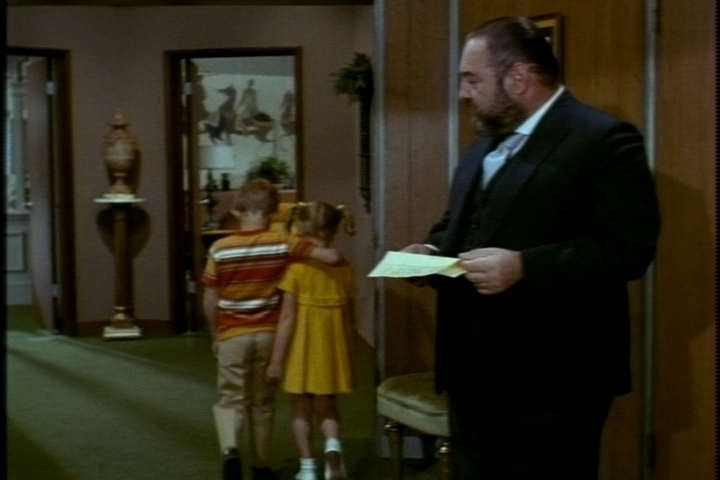 “Well, ciao, everybody,” Bill says, sending the twins back into a panic that he’s saying goodbye again. French and Cissy explain that ciao, like aloha, can mean hello as well as goodbye. 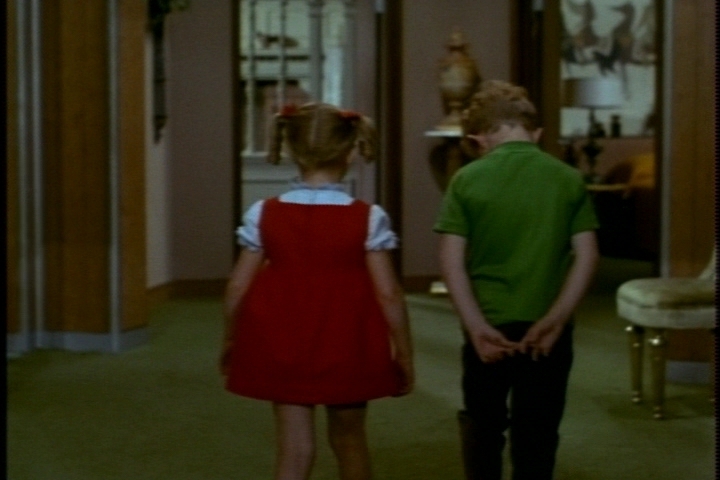 “Well, say aloha, or say ciao, but don’t ever say goodbye,” Buffy says. Episodes that threaten the Davis family unit are always moving, and this is no exception. 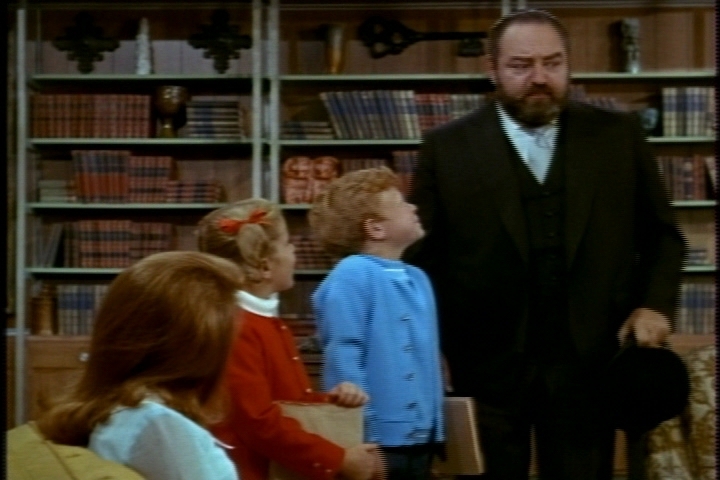 The commitment that “Uncle French” shows for the children is especially sweet. 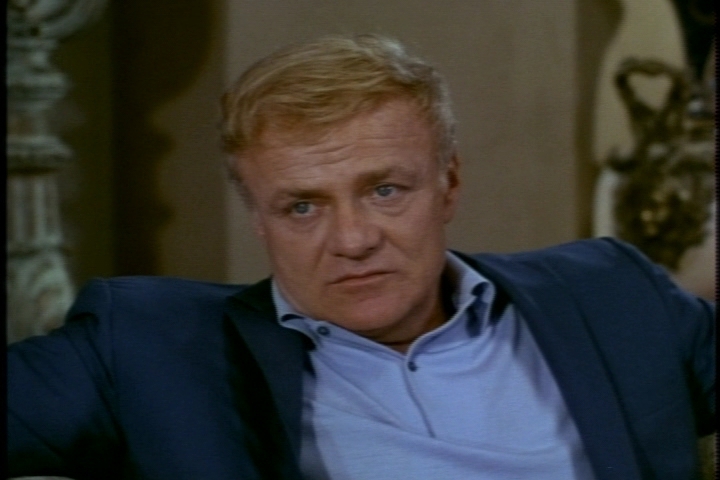 It’s interesting to realize that this episode had some parallels to Brian Keith’s own life. In 1969, he would divorce his long-time wife Judith Landon and marry a much younger woman. Victoria Young was, in fact, five years younger than the actress who played Lucianna here. 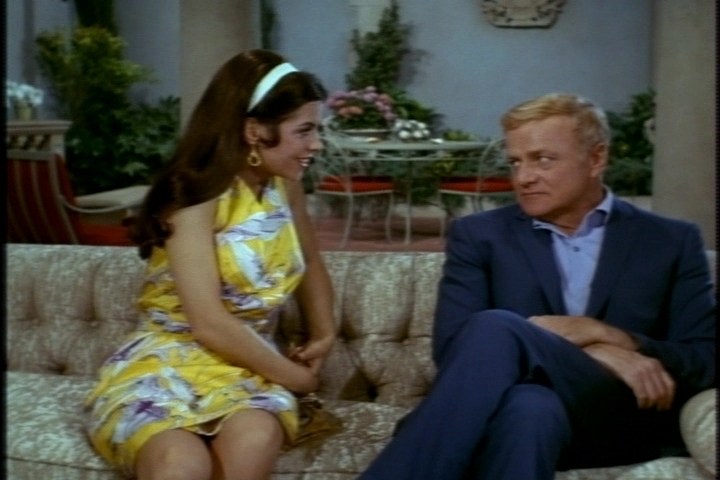 Parts of this episode also remind of The Parent Trap, with Lucianna in the role of Vicky. 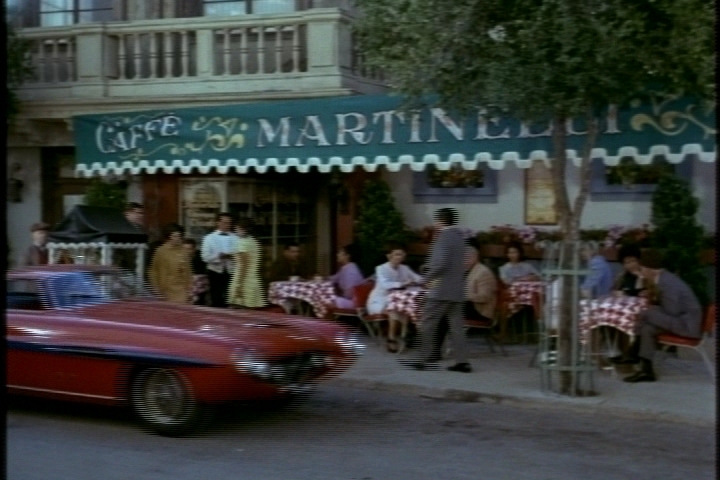 Fun coincidence: Bill and Lucianna eat at Caffe Martinelli. 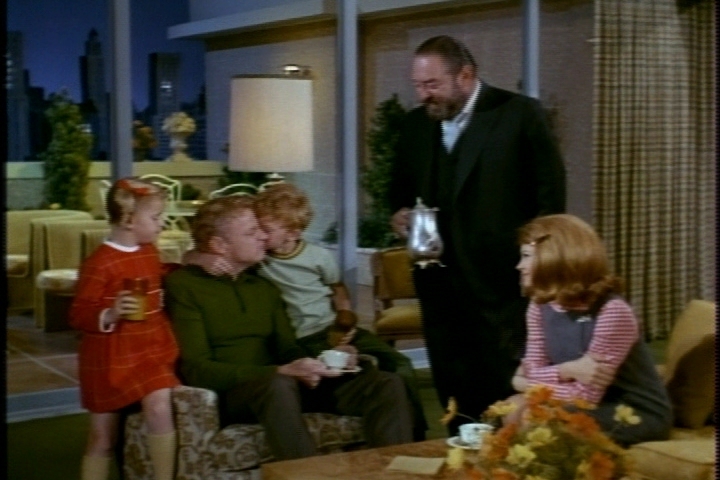 Martinelli’s was the parents’ special restaurant in The Parent Trap. Maybe Lucianna should have tried Vicky’s “Swiss boarding school” plan. 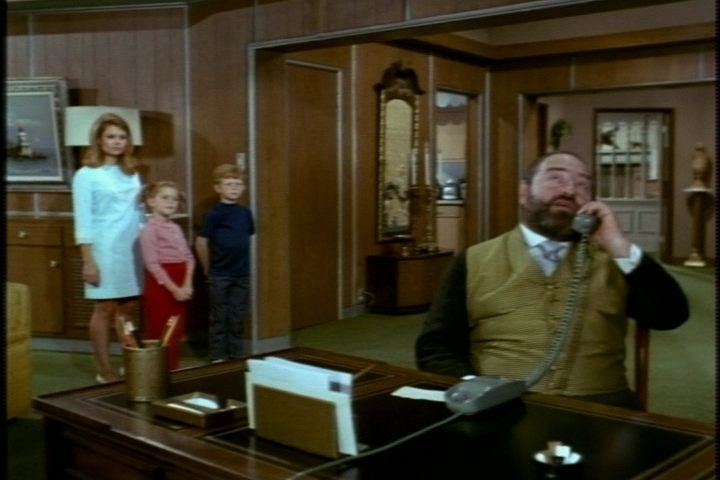 This episode also foreshadows Executive Producer Don Fedderson’s next series. To Rome with Love, which would premier in 1969, starred John Forsythe as a single father raising three girls in Rome. 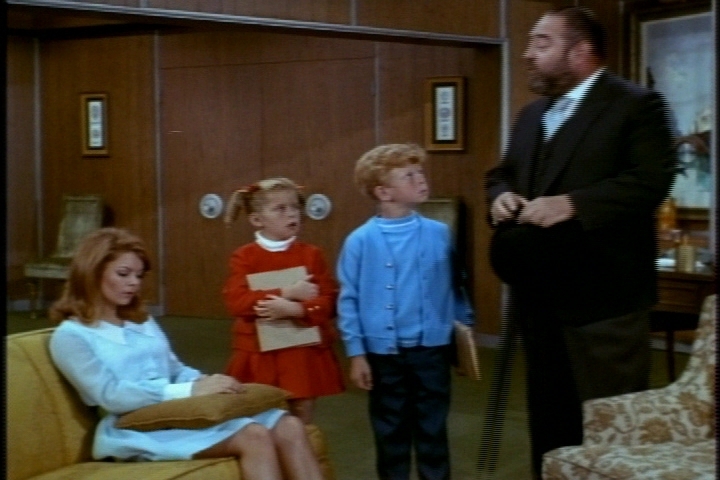 Anissa Jones, Johnnie Whitaker, and Sebastian Cabot would all appear as their Family Affair characters in one 1970 episode of that series. 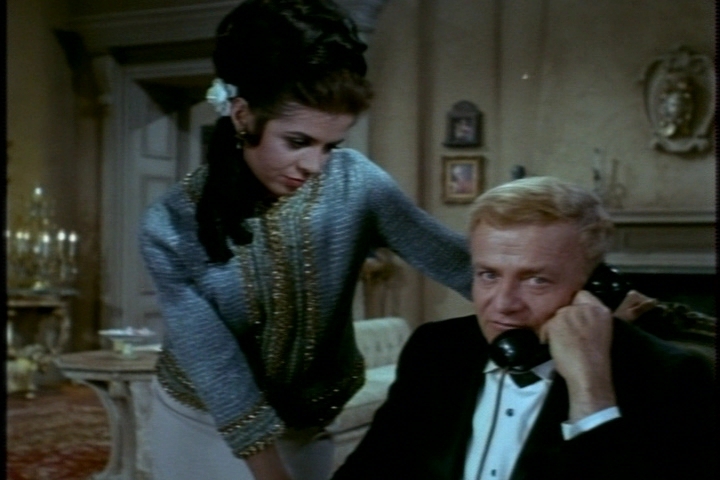 Brioni Farrell, who plays Lucianna here, also appeared in one episode of To Rome with Love. 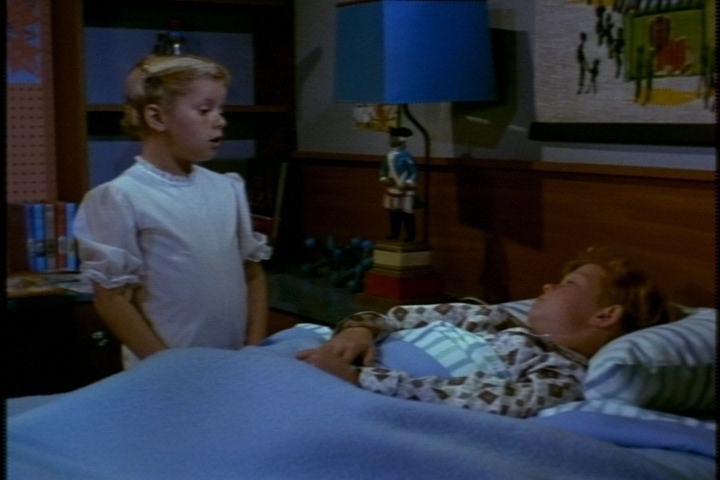 This episode’s big dog scares Cissy, but Oliver didn’t. Maybe all the other tension this week increased her anxiety. Lucianna: Brioni Farrell. Mr. Foster: Gus Edwards. 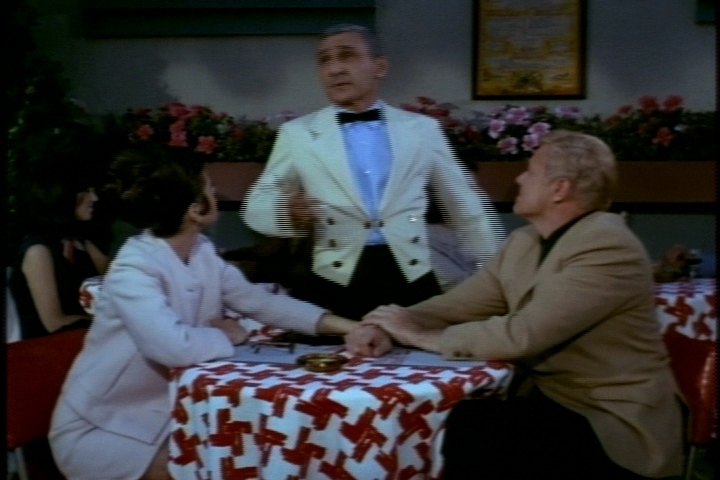 Waiter: Ralph Lanza. Greek actress Brioni Farrell had a low-key but steady television career through the 1990s. 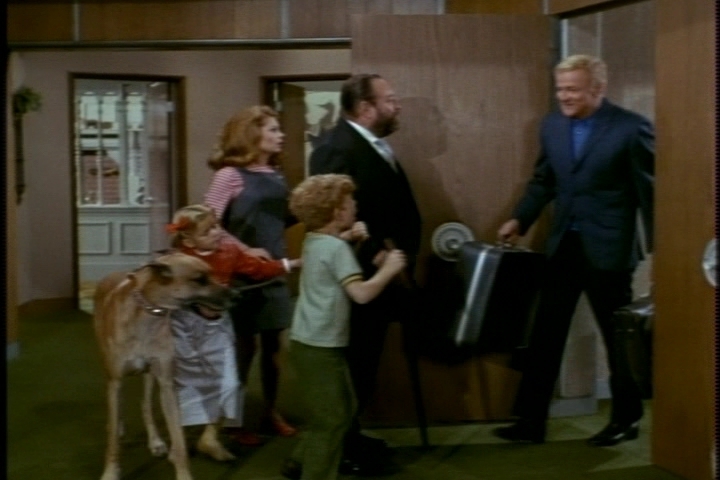 Edwards would appear once more on Family Affair as the mailman. LOL at the “Retreat of Sadness” tally. I wonder what the over/under is for those on the entire series. I’d say about 72. It’s probably running about even with Uncle Bill’s Head Rubs of Consternation. I was starting to get worried about Uncle Bill. I was concerned that he might be turning into a Big Jerk. On a side note, I like Cissy’s definition of a “Villa”. I think I will use it the next time it comes up in conversation. Yes, the villa remark is good. I’d like to use it the next time I visit my villa. Unfortunately, I don’t have a villa. 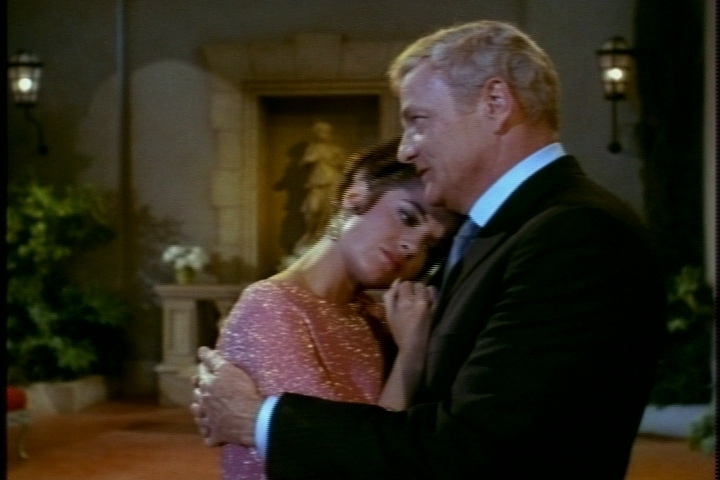 ‘It just happens I love you so much that I’m not ever gonna let you down, you got that through your head?’ Was Bill’s not particularly mentioning the kids’ move to Rome really enough to make Cissy forget that really very strong, very affectionate statement Bill made in Season 1? I also find it weird that French lets himself talk into thinking that there might actually be the possibility of Bill abandoning the kids. Well, at least you didn’t have much to catch up on because my real life has kept me from posting much lately. Your trip sounds lovely! 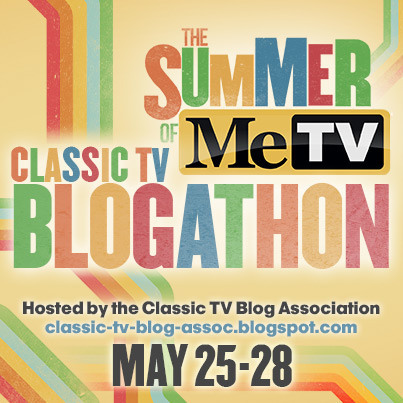 Yes, the premise of this episode is a bit crazy, but I enjoy so much that I’m willing to overlook a lot. I can see the kids doubting Bill because their insecurity flares up frequently. French believing that Bill would not only abandon the family, but abandon them without any means of financial support, is bizarre. I guess the four of them wound themselves up into a folie a quatre!